Sorry, VGod Pro Drip RDA has been discontinued. The Vgod Pro Drip RDA is a 2 post, dual terminal build deck with PEEK insulators. This 24mm RDA has dual exterior airslots connected to the quad internal airholes. This RDA also features the VGOD name engraved into the side. The terminals measure 2mm by 2mm with side secured screws, allowing you to fit fairly large builds inside. The VGOD Pro Drip Rda is definitely an RDA designed for both hobbyists as well as serious builders. 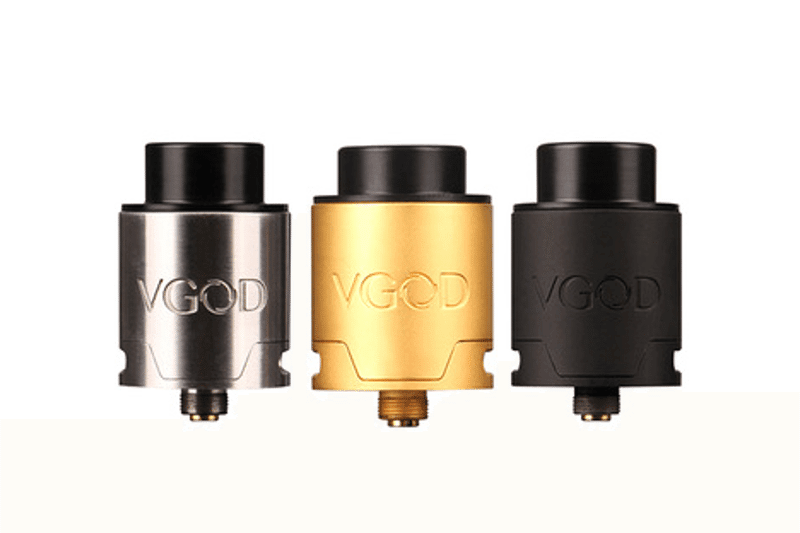 The Vgod Pro Drip RDA is the latest competition-ready rda from VGOD. It features a 2 post, dual terminal build deck with PEEK insulators. This 24mm RDA is sleek with is dual exterior airslots while still giving a smooth draw from the quad internal airholes, which are directly under the coils. This RDA also features the VGOD name engraved into the side to showcase the product. The terminals measure 2mm by 2mm with side secured screws, allowing you to fit fairly large builds inside. The VGOD Pro Drip Rda is definitely an RDA designed for both hobbyists as well as serious builders. Love this deck, two post are my go to for drippers. One of the features that I love the most on the VGOD is the cap. It's very easy to remove and seamless for cleaning. Even tho it's a dripper, the well is very deep. Around .5 for juice storage so you don't always have to drip as often in comparison to other drippers.